Pre-heat oven to 350 degrees and prepare muffin pan with paper liner or cooking oil and set aside. In a medium bowl mix together all of the dry ingredients until well combined. Mix together the water and milk and slowly mix into the dry ingredients. Mix until all dry ingredients are wet. 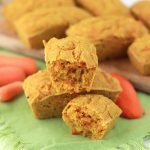 Fold in the carrots, pour batter into muffin pan filling almost to the top. Bake in center of oven for 25 to 3 minutes or until a toothpick inserted in the center comes out clean. Serve warm or allow to cool before serving.